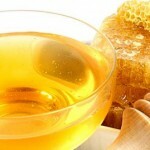 For thousands of years honey has been used successfully in skin treatment. When you make honey wound dressing there is intense exudation in an hour, which mechanically washes germs away. At the same time there is energetic phagocytosis. Honey is not only mechanically cleans the surface of the wound from germs, but also has detrimental effect on them due to its antibacterial properties. Best results are obtained by the medical use of honey in combination with fish oil, which contains a lot of vitamin A.
Troche of honey and flour in equal amounts is known as folk remedy for the treatment of various types of boils and carbuncles. For abscesses people use ointment of the following composition: wax, 1 part of rosin and turpentine are bolied a light heat, stirring. Turpentine should make the ointment, which can be spread on a cloth. Willingness of ointment is checked by a drop on the glass (it should harden quickly). For the treatment of trophic ulcer you prepare 100g of pine resin, 100 g of lard, 100 grams of beeswax. All is melted for 30 minutes on a steam bath, cooled and you can lubricate the skin around the ulcer and the ulcer itself one time a day for 2 weeks. Exclude from the diet all flour and sweet food. For the treatment of abscesses and boils combine 1 raw egg yolk from domestic chicken, 1 tablespoon of melted liquid honey, 1 tablespoon of unsalted melted butter and flour. Knead the dough of medium thickness, put on the affected area and bandage. Change the band 2-3 times a day. Put unused dough in a refrigerator. Take a piece of dough, knead in the hands and apply to a sore. Boiled onion peel thoroughly mix with plantain leaves in equal proportions, add flour and honey, make a thick batter. Make a lozenge and put on the boil or abscess, fixing with a bandage or adhesive plaster. After the boil (abscess) reveals (1-2 days), clean the skin around with alcohol or vodka. These scones well treat deep cracks on the soles and heels. Folk medicine treats eczema, burns, ulcers, pyoderma, abscess acne and even painful corns with juice of fresh potatoes. Adding honey multiplies its anti-inflammatory properties. Thoroughly wash and brush raw potatoes, scrub it on a very frequent grater. Mix 1/2 cup of pulp and 1 teaspoon of honey. This mixture is put on a piece of bandage or gauze and apply to the affected area of the skin. Layer of slurry on gauze should be about 1 cm thick. Then gauze with gruel is fixed with bandage and held for at least 2 hours. Removing gauze, clean seeping through the gauze slurry with a spatula or the blunt side of a knife. These bandages during the day you can do a few times. At night, the skin surface can bandage with propolis ointment, and during the day you can repeat the application of potatoes and honey. For the treatment of hematomas (bruises), abscesses, boils, purulent fistulas you can use packs of a special “dough”: 1 egg yolk , 1 tablespoon of honey and 1 tablespoon of vegetable oil mix with the flour to form a dough. Compress is applied for one day. To treat oily seborrhea mix 1 teaspoon of honey with 1 cup of oak bark decoction (1 part of bark with 5 parts of water). For the complex treatment of acne people use honey and cucumber juice. For this purpose take 3 tablespoons chopped cucumber, pour a glass of boiling water and infuse for 2-3 hours. Then filter, squeeze sediment, add 1 teaspoon of honey and stir well to dissolve. , Wipe the face after washing or lubricate it with a cotton swab dipped in the mixture and wait until the liquid dries. After 30-40 minutes rinse face with cool water. Take 1 teaspoon of pollen, 2 times a day for half an hour before meals. Mix 50 g of birch tar, 10 g of honey, 20 g of ash of branches of rosehip, 20 g of castor oil, 1 fresh egg white, keep 3 days and lubricate sore spots. For the treatment of eczema you can mix thoroughly 2 tablespoons of tar, 1 tablespoon of honey, 1/2 teaspoon of beeswax, 1 tablespoon of powdered copper sulfate, 1 tablespoon of vinegar, 4 tablespoons of sunflower oil. Apply a thin layer to the affected skin. 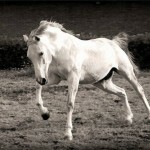 Treatment – is up to a full recovery. For the treatment of acne and seborrheic dermatitis you can use sage tea with honey. For this purpose take 1 tablespoon of sage leaves, pour 1-2 cups of boiling water. Keep covered for 30-40 minutes (or boil for 5 minutes on very low heat). Then filter and add 1/2 teaspoon of honey per 1 cup, stirring it well. Use warm infusion 2-3 times a day. Take a glass of warm boiled water, add 1 teaspoon of honey and 1 teaspoon of tincture of calendula, mix well and use the mixture as lotions for the treatment of acne, oily skin. For the treatment of eczema use ointment consisting of honey mixed with the flour of dried dandelion. Wash it off with warm buttermilk cream. For the treatment of eczema wash 50 g of ripened wild rose with warm water and let it dry, then pour 100 ml of sea buckthorn fruit oil and keep 17 days in a warm place, then strain and mix with 50 grams of honey. For the treatment of dermatosis take pulp of fresh rose hips without seeds, mix with honey (1: 1), keep for 3 days. Then add 2 parts of 50% propolis tincture, mix and lubricate sore spots. 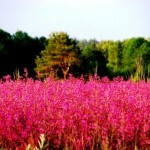 For the treatment of erysipelas skin use cream of wild rose petals, boiled with honey. Pus and infected wounds are treated with compresses: 30% solution is prepared from distilled or digested water and honey. The solution temperature should not exceed 32 ° C (89 F). If you are unable to prepare a solution, the wound is simply smeared with honey and put a light sterile dressing. For the treatment of burns and big wounds it is recommended to lubricate them with honey cream. To prepare it mix thoroughly in a mortar and grind 1 tablespoon of Cudweed (powder), 1 cup of creamy unsalted butter, 1/2 cup of honey. For the treatment of burns put in a pot 100 g of unsalted butter, 40 g of wax and 1 tablespoon of flax seed . Simmer for 20-25 minutes. Composition is spread evenly over a canvas or linen, put on the affected area and bandage. Change dressing every day until the place has new skin. For the treatment of burns wash, peel and grate fresh potatoes. 1/2 cup of potato pulp mix with 1 teaspoon of honey, apply a layer of 1 cm on a gauze. Attach it to the burned area and bandage. After 2 – 3 hours change the bandage. It provides an excellent effect not only for burns, but for acne, chronic ulcers, eczema and other skin diseases. 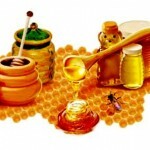 For the treatment of burns smear burned area with honey without any dressing. Sores also can be lubricated with a special compound made from 80 grams of honey, 20 g of fish oil. The ointment is applied to the cleaned wound in a bandage. 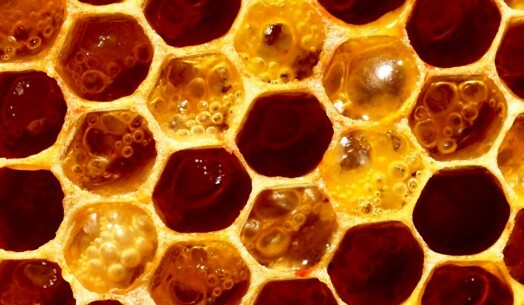 Poorly healing wounds and ulcers are smeared with honey, putting it in bandages. It can be used as local bath (30 g of honey in 100 ml of water with a temperature 32-34 ° C (86 F)) for 20-30 minutes a day, 1-2 baths to recover. For the treatment of various wounds and sores, pour 1 cup boiling water, put 1 tablespoon of dry grass of Cudweed, leave for 30 minutes, drain, add 1 tablespoon of honey. Use externally for washing wounds and ulcers. 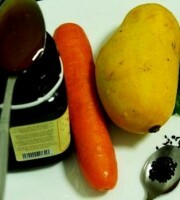 Can be used inside 1-2 tablespoons for half an hour before meals for the treatment of stomach ulcer. For the treatment of wounds pour 0.5 liters of water, put 50 grams of eucalyptus leaves, boil for 3-4 minutes, drain and add 2 tablespoons of honey. Use in the form of lotions and baths. For the healing of wounds you can apply ointment, made from lard, beeswax and pine-resin, taken in equal numbers. The mixture is placed in a bowl (you can not use aluminum) and boil, stirring, on low heat for 5-10 minutes. Finished ointment is poured hot in wide-mouth jars and put on the wound under the bandage. An onion, baked in the ashes, is rubbed with honey and applied to boils. It cleans the wound of pus, reduces pain and swelling, it promotes rapid healing and scarring. Mix equal parts of grated pepper meat and honey and apply to the crack in the heel. You can leave overnight. The procedure is repeated 3-4 times a week. Onion juice, mixed with equal quantity of honey, is used for the treatment of warts and corns. The mixture should be applied at night, covered with compress paper and bandage. Protect the skin around with the zinc ointment or Vaseline. Procedures are done daily until disappearance of warts and corns. To remove freckles, use a mixture of immature berries of black currant and honey: 1 tablespoon of fruit mash and 1 tablespoon of melted honey. Smear skin with a mixture. After 30 minutes remove the mask, wipe the face with lemon juice or lemon water. Sour black currant juice with honey whitens the skin. 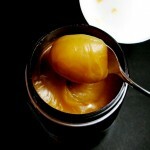 For the treatment of excessive hairiness on the face, if the skin is oily or normal, you can try Arab method for bleaching hair without any risk to the health: 1 tablespoon of warmed honey is mixed with the juice of half a lemon and smear with a hot mixture areas of the face, covered with hair. The dry mixture remove with your fingertips. Hair gradually fade and facial skin always remains soft and supple. To prevent skin cancer you can drink cranberry juice with honey. For the treatment of bruises take 1 tablespoon of honey mixed with 2 tablespoons of natural yogurt. Smear with the resulting mass the injured spot with strengthened bandage for 2 days. For the treatment of the nail fungus make the bath with a saturated solution of potassium permanganate. Then make gruel of 10 g of propolis and 10 ml of 96% alcohol. Lubricate the nails, especially the affected areas, tie a bandage and change the bandage every other day to cure. Grease cracked lips after each meal with natural honey mixed with pork visceral fat (2: 1). 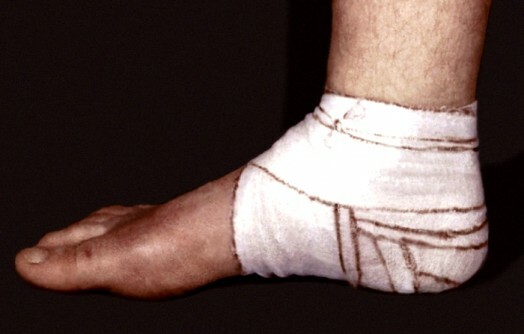 For the treatment of cracks on hands or feet put the mixture under the bandage for 2 hours every day or two to heal. For the treatment of hydradenitis take one tablespoon of honey warmed in a water bath (if you have crystallized honey), mix the flour, make flapjack, and apply at night to the sore spot in the form of compress, covering the flapjack for insulating with plastic bag. The following night, a honey pastil is replaced and so do to recover. For the treatment of abscess thoroughly mix butter, honey, Vishnevsky ointment and pure alcohol, taken in equal quantities and apply as a compress to the affected area at night. Make infusion of Cudweed (1:10). Put 25 g of dried minced raw cudweed in an enamel bowl, pour 250 ml of boiling water, cover and infuse for 15 minutes in a boiling water bath. Then let the infusion cool, strain it (press remaining raw cudweed) and increase the volume of infusion with boiled water to 250 ml. Dissolve 1 tbsp. of honey and use for washing, irrigation and lotions for festering, long-term healing wounds, ulcers, burns, skin, acne, etc. It can be taken inside – 1/4 cup 2 – 3 times a day 20 – 30 minutes before a meal as an anti-inflammatory agent for peptic ulcer and duodenal ulcer. Take 1 tbsp. of powder of Cudweed and carefully grind in a mortar with 1/2 cup of unsalted butter and the same amount of honey. Use the ointment for the treatment of burns, non-healing wounds and ulcers. Lubricate surfaces of poorly healing ulcers and wounds with honey and apply it with bandages. Moreover, you can also apply the local baths of 30% honey with a water with temperature of 32 – 34°C (90 F) for 20 – 30 minutes. Every day, take 1 – 2 bath until complete recovery. Take 80 grams of honey, 29 g of fish oil, 3 g of xeroform and mix well. Use the ointment in bandages. Store it in the refrigerator. Take 80 grams of honey, add 20 g of melted lard, stir well, and use the ointment for the treatment. Mix 50 g of dried powdered leaves of eucalyptus with 0.5 liters of boiling water, boil for 7 – 10 minutes, insist a half-hour, drain, add 2 tbsp. of honey, stir until it is dissolved and use for irrigation of inflamed skin and mucous membranes, as well as cuts and wounds. Usually trophic ulcers of the lower extremities occur as a background of varicose veins and thrombophlebitis. This collection of medicinal plants will help to reduce blood clotting and heal venous ulcers (the amount is given in grams): tripartite bur-marigold grass – 20, St. John’s wort grass – 20, licorice root – 15, coriander seed fruit – 15, chamomile flowers – 10, toadflax common grass – 10, cottonweed swamp grass – 10. Put 2 – 3 tbsp. of dried minced collection in a thermos, pour 0.5 l of boiling water, keep for 2 – 3 hours, strain and drink 1/2 cup 3 times a day after meals for the treatment of venous ulcers and thrombophlebitis. The course of treatment – 1 – 2 months. 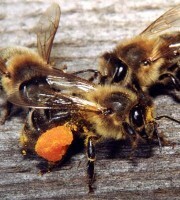 Simultaneously apply a bandage with 50% propolis ointment on vegetable oil and eat 1/2 – 1 tsp. 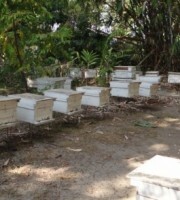 of pollen 2 – 3 times a day. Take equal parts (for example, 20 g) of pine-resin, powder of nettle, swine visceral fat, beeswax, and boil. Apply the resulting ointment with bandages to the wound or poorly healing ulcers. 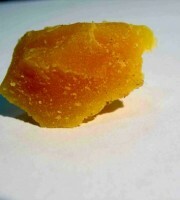 Boil 100 g of sunflower oil or other vegetable oil for 10 minutes, then remove from heat, add 0.25 g of beeswax and stir. After cooling, add 1 egg and grind to form an ointment. Apply it to the burned area. Taken in equal weight ratios oil and beeswax keep for 15 minutes in a boiling water bath. Smear gauze and put on the burn area. Mix 100 g of olive oil, 20 g of pine resin, 1 tbsp. of fresh butter, 8 g of yellow wax, and 5 g of white wax, then put on low heat for 10 minutes with constant stirring (remove the foam that appears on the surface). Ready balm is spread on gauze and applied to the wound difficult to heal ulcers, etc. Store in a refrigerator in a glass jar. Take in equal parts (eg, 10 g) pine or spruce sap (resin), pork suet and beeswax. All mix, boil until dissolved, strain and cool. Bandage with ointment is applied on the affected area. Take 40 grams of pure beeswax, 60 g of olive oil, boil on low heat, then put into a glass jar. Store in the refrigerator. 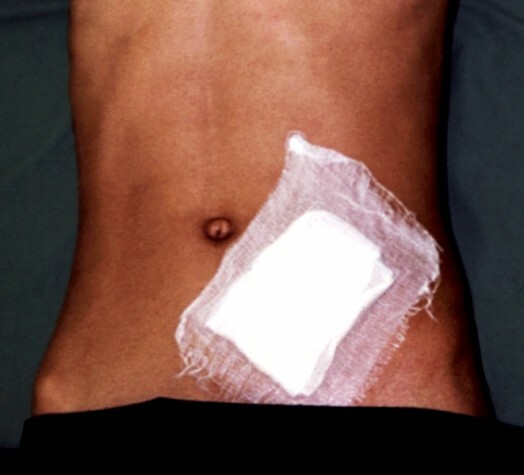 Wash the wound (ulcer) with hydrogen peroxide, then bandage with cooked cream. Take 20 grams of beeswax, 20 g of spruce resin and 30 g of vegetable oil. In the warmed on low heat vegetable oil put the resin pieces, after its dissolution add pieces of wax, stir until dissolved, pour into a dark glass jar, cover and store in a cool place (ointment keeps its properties for years). Take 1/2 – 1 teaspoon of pollen three times a day before meals to heal wounds and fractures. This post will help the internet users for setting up new web site or even a blog from start to end. I wonder how much attempt you set to create this sort of great informative web site. reason why I cannot join it. Is there anybody getting similar RSS issues? dailly and take fastidious information from here every day. More weight equals more estrogen equals less testosterone. students. Recommendations for Prevention of a Health Care Fraud:.